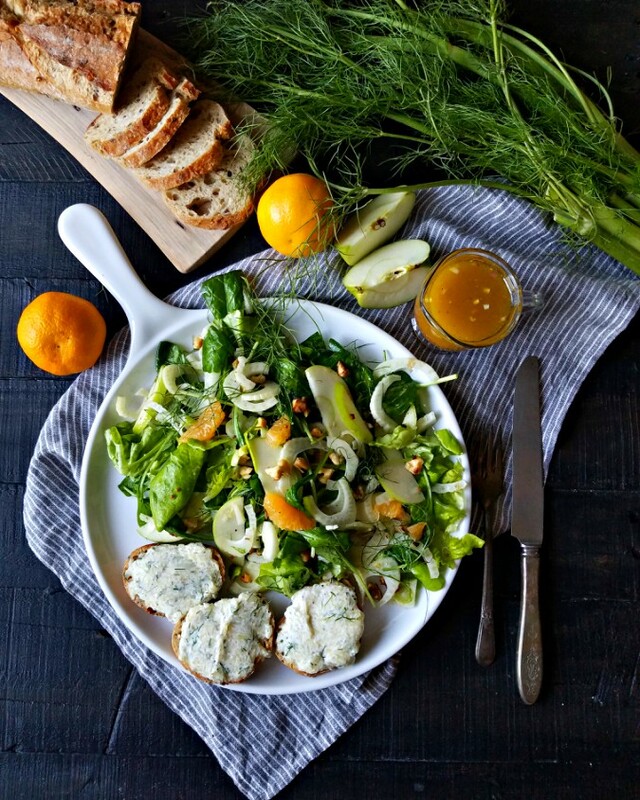 I'm back from vacation and back to cooking and trying to eat slightly lighter, which is why the first recipe I made from Valerie Bertinelli's new cookbook was Arugula, Apple, and Fennel Salad with Citrus Vinaigrette and Three-Cheese Crostini. I received a preview copy of Valerie's book and am impressed by the gorgeous photography, including Valerie herself who looks about 30 years old, helpful tips about ingredient substitutions and steps you can do ahead of time. I've watched Valerie's show on Food Network for some time now and find her recipes simple, approachable, and quite appealing. 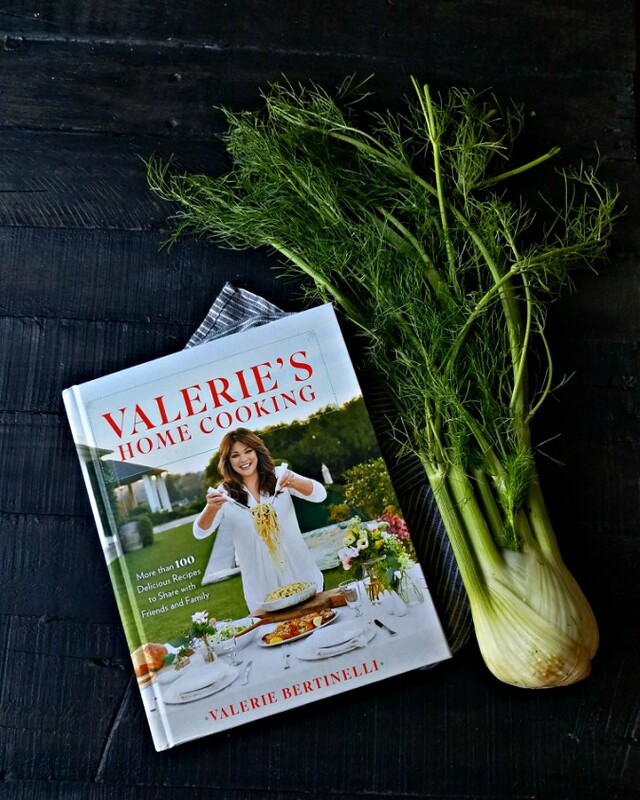 The cookbook, called Valerie's Home Cooking, has the same feel to it. 1. Preheat the oven to 375F. Whisk together the shallot, citrus juices, honey, mustard, salt, and white pepper; let stand for 2 minutes. Add the extra virgin olive oil in a slow, stead stream, whisking until blended. Set aside the dressing. 2. 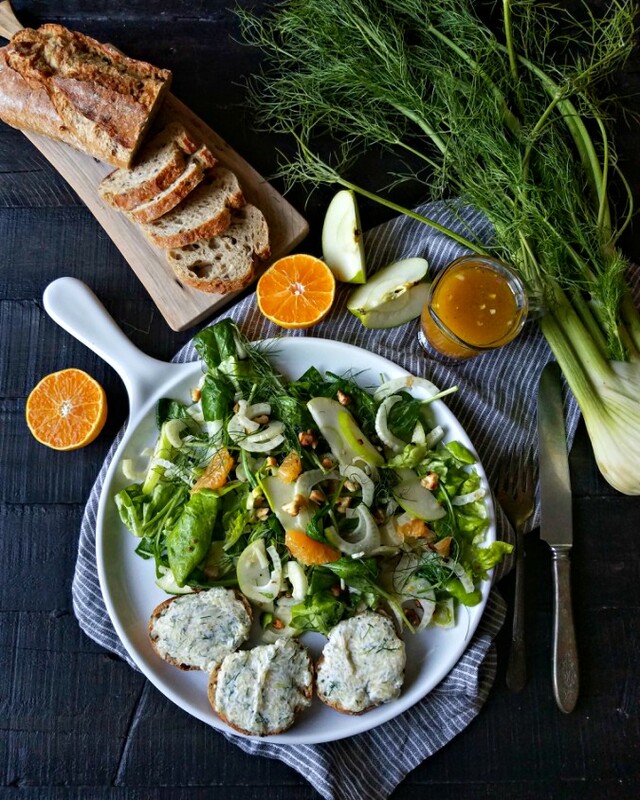 Toss together arugula, Bibb lettuce, apple, fennel bulb, and walnuts in a large bowl. Set aside the salad. 3. Place the baguette slices in a single layer on a parchment paper-lined baking sheet, and lightly brush the tops with olive oil. Bake until lightly toasted, about 2 minutes. Remove from the oven. 4. Stir together the cheeses, lemon zest, and black pepper in a small bowl; stir in 1 tablespoon of the reserved chopped fennel fronds. Spoon about 1 tablespoon of the cheese mixture onto each toasted bread slice, and return to the oven. Bake until the cheese slightly melts and the bread edges are crispy, 2 to 3 minutes. 5. Add the dressing to the salad, and toss. Divide the salad evenly among 4 plates, and serve with 2 crostini. This was a great light lunch. I can't believe there was a time when I did not like fennel! I will be posting another recipe from Valerie's book soon: stay tuned! Disclosure: I received the cookbook free of charge but am not compensated for this post. All thoughts/opinions are my own.